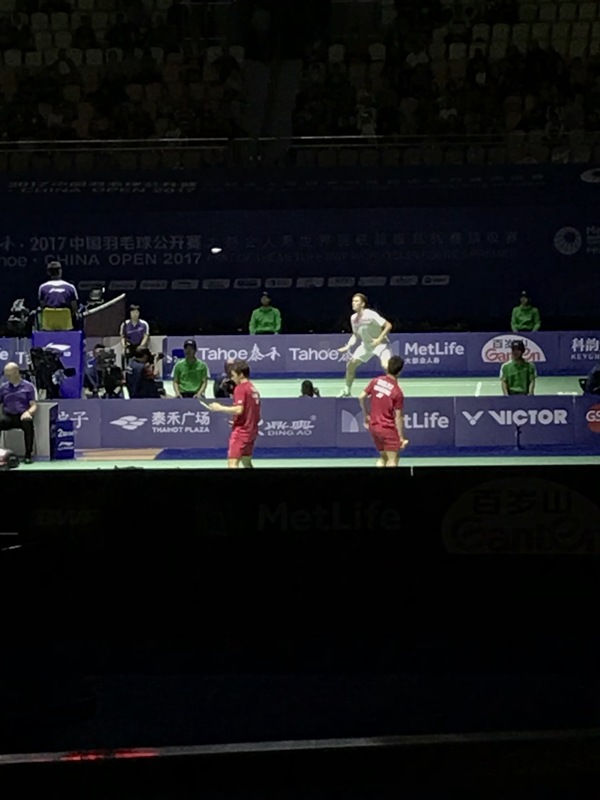 So I went to the Tahoe 2017 China Open in Fuzhou, China yesterday and oh my god you guys, I MET LEE CHONG WEI!!! And we even chatted for a minute and everything. He was super nice, and asked me a lot of questions starting with where I was from, I told him I was an American living in China, and he asked me things like if I could speak Chinese and how long I was in China. We only had maybe a minute together, but he signed my shirt, then sat and just chatted. I asked him for a selfie and he happily obliged. So how did I get this once-in-a-lifetime opportunity to meet him? Well, I kinda just stumbled into it. You see, Azhi and I arrived at the competition about an hour early. 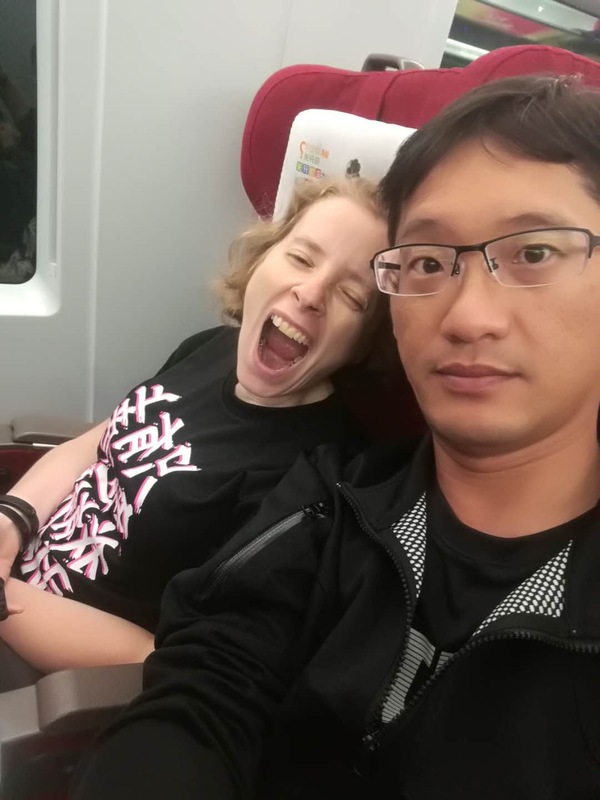 We had set off from Xiamen early, it was an hour and half train ride away, and didn’t have a bite for breakfast. Worried about the time I thought we could just go straight to the stadium, because it was across the city, and find something there. The area outside the stadium had a ton of pop up shops. That turned out to be a bad idea as the stadium had almost no food, but it was a good idea for arriving early, because all the shops outside (set up special for this event) didn’t have a lot of people. There was Yonex, Victor and Lining shops. Yonex was the first by the gate and they have some (very ugly) competition t-shirts. They were 188rmb ($30) and even though the design was fugly, I had to buy one. It’s not everyday you go to a BWF Superseries Competition, right? 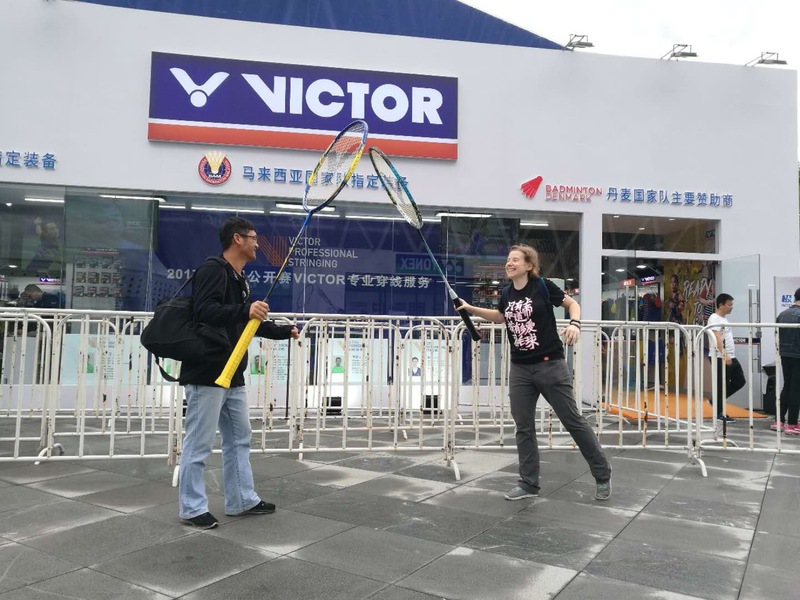 Then we went to the Victor store where we got to play with some giant rackets. This was us pretending to play a competition against each other. Then we passed some small stalls and found one selling fried chicken legs and waffle fries. We each got one chicken leg and shared a small swerving of waffle fries. It would be the only thing we would eat all day until 6pm. I was a little camera happy as I took (and made Azhi take) a ton of pictures all day long. But I was riding high on the excitement of it all and after our meager nourishment we went to the Lining store. There were people lining up in front of an empty table. We figured out some Chinese players were coming to sign and we got in line. A woman came up to us and asked if he had Lining products. I said “yes,” thinking that my rackets use Lining strings and she said it was a line for two players and I smiled and nodded. “When will they sign?” I asked. “20 minutes,” she said. Azhi and I kinda looked at each other, the competition was starting in 20 minutes and I didn’t want to wait in line that long for people I wasn’t very familiar with. We stepped out of the line and went into the shop part to look around. As we walked into the Lining store I said to Azhi, “Oh wait. She asked if I had Lining stuff right now, right? Like, they could only sign Lining shirts and things?” Azhi nodded and said that’s what she was trying to get at. So each company had various players signing, but only signing things from that shop. Lining is the official sponsor of the Chinese team, and as such makes all their uniforms and stuff, which is cool, but the products are so expensive. Like $80-$100 just for a shirt. I wasn’t willing to buy it just to get a signature. So we had 20+ minutes to kill before the competition started and I wanted to go back to the Yonex area to look at the stringing room. 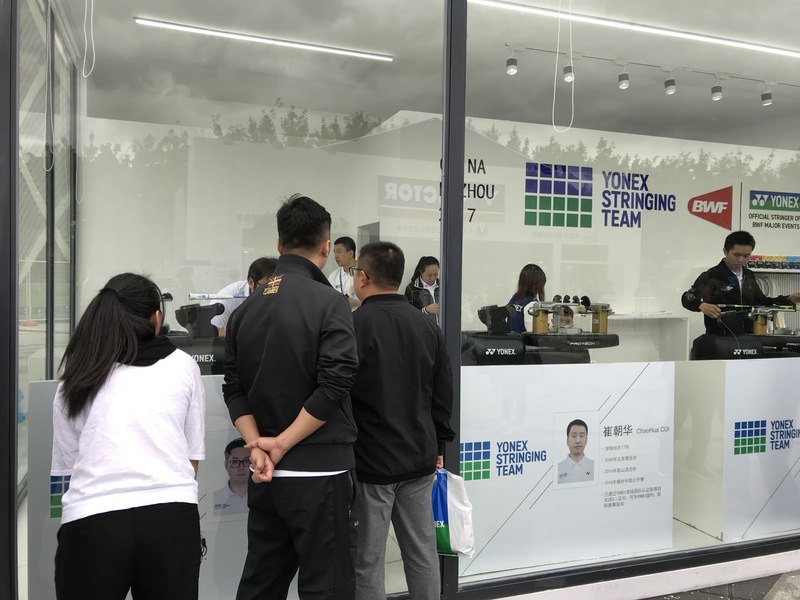 They had a white walled, glass-front room filled with the official Yonex stringers. No one was allowed to enter the room except the players (no customers. It was strictly to string the professionals rackets) and the stringers were on display like mannequins at JC Pennys. 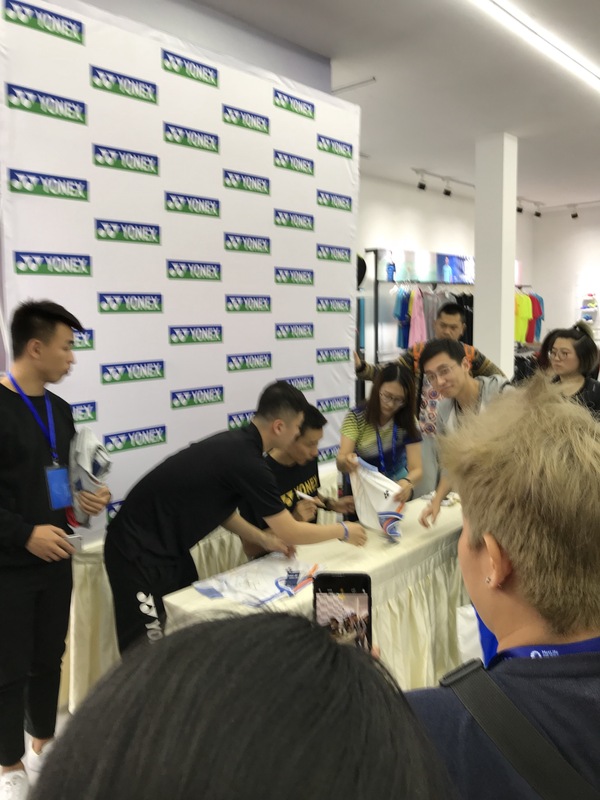 So we were looking and I see people lining up at the Yonex store for some signing. 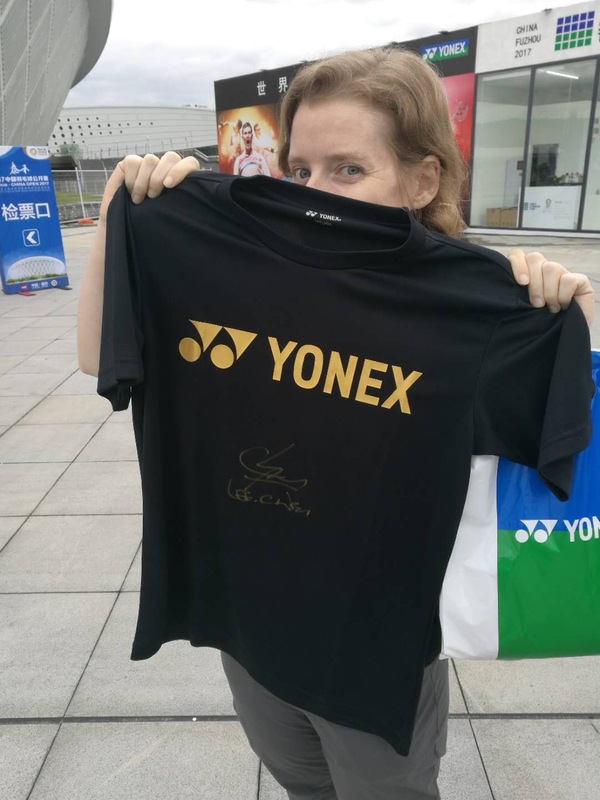 I had bought Yonex clothes (the competition t-shirt) and I thought I overheard someone say that if you bought more than 150rmb purchase you could get in line. My shirt was 188. There was metal barriers and a guard standing at the front letting people in. Everyone was showing him their receipt, and he was arguing with some people and not letting them in, and I couldn’t even find my receipt but I held up my bag and kinda opened it and he waved me in. The line was not long at all. No more than 40 people total, and soon after I entered it, they closed it and didn’t let anyone else join. Azhi was outside the line and honestly, I didn’t exactly know what was going on, or even who was signing. Then I figured it out: Lee Chong Wei. Me standing in line. I was nearly at the end of the line so you can see how few people were allowed to line up. By the way, I should mention my shirt. It says “Only God knows how much I love badminton,” and I know I’m a super nerd for wearing it to the competition. I accept that. 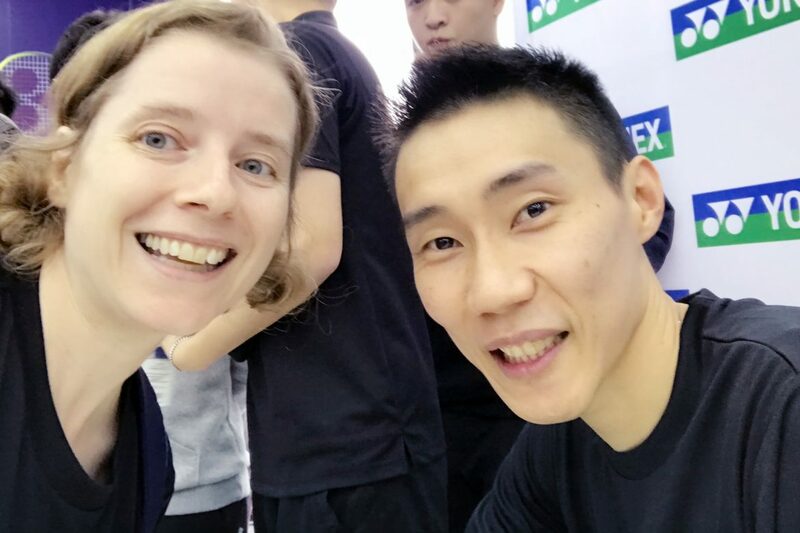 The whole thing took about an hour, and I’ll spare you the details (though I did run into 2 different friends walking by while standing in the line) but sure enough a big SUV pulls up and Lee Chong Wei steps out! There was a big crowd ooing and ahhing as he was ushered into the store (seriously, I doubt Jay-Z would get as big a reception as LCW did. I love how badminton players are like rock stars in China). I can’t see what’s going on in the store, but slowly we are being let in one-by-one. At this point I’m pretty excited and don’t really know what to say to him. As I get closer I see the total chaos surrounding him with security, photographers, Yonex staff, his own helpers. Two people grab the shirt or whatever item it is he is to sign and stretch it out in front of him, while another staffer shakes golden paint pen (which he is using to sign as many of the clothes are black) and there are abut 4-5 people taking pictures and several security guards kinda pushing people to stay in line. There was a real frenzy around Lee Chong Wei. As badminton royalty I’m sure he’s used to it, but I felt really bad for the guy as it seemed so frantic and crazy. I was watching the people in front of me and how the interacted with him. They looked excited, and as he had his head down signing, they had their friend take pictures. I watched maybe 10 people in front of me and not one single one talked to him. Now being a foreigner, I know a little of the hysteria of Chinese people giving you attention. Like, walking the streets of China I am often made to feel more like an animal than a human, with people calling to me expecting me to drop everything and come to them, or like some sort of prop or statue they can throw their arms around and take a picture of without any concern for me as a human. And that’s how I felt people were reacting to LCW. I’m sure he’s used to it by now, but I decided I would look him in the eyes, speak to him and just give him a bit of humanity in the midst of all this. Turns out he was gracious and nice and looks genuinely happy in the picture we took together. Possibly sick of all the attention he asked about me and not only asked questions, but listened to me and asked other questions based on my answers. (You might think that sounds silly, but I get a lot of strangers coming up to me and asking me questions and it drives me crazy when they don’t listen to my answers. 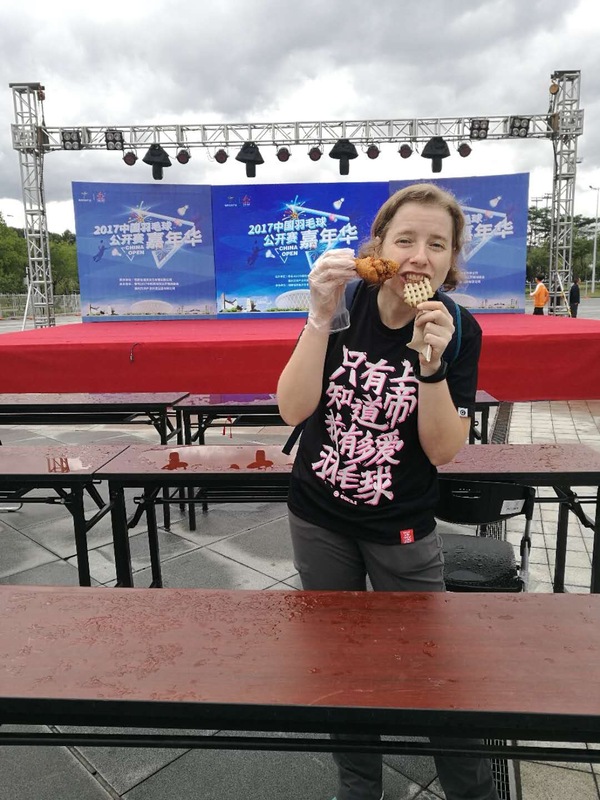 Like first they ask me how long I’ve been in China and after I say almost 8 years they ask if I eat noodles, or can use chopsticks–like I would be here for that long without doing these 2 basic things?! But I digress) . It was chaotic being in the limelight with him and since he actually stopped signing for a minute, and looked at me and chatted, the people taking pictures around us intensified. We finished up and I thanked him and waved and he smiled. I almost slipped up and wished him “good luck in your game” but I stopped myself in time (he lost the day before and wasn’t playing anymore). Anyway, really nice guy who somehow managed to keep his cool and composure in the midst of all that madness. As if his badminton achievements weren’t enough he clearly mastered the art of public appearances. Here’s the picture again. Basically my favorite picture ever. The shirt he signed for me. Now I don’t know if I should keep it clean and never wear it, or wear it and lose the signature through washes. Honestly, after that, the actual competition was downhill. We tried to buy center seats, but the website said they were all sold out. Clearly, they weren’t, the stadium was maybe 1/3 filled, and our seats, while in the front row, were on the side which was a little too far from the action to see everything. Although I liked our angle for watching the birde fly and I could see the speed and intensity of it. We were at the semifinals and I saw Denmark win mixed doubles (the game I was looking forward to the most), saw Viktor Axelson win men’s singles (man, that guy is tall!) as well as Chen Long win his men’s singles. 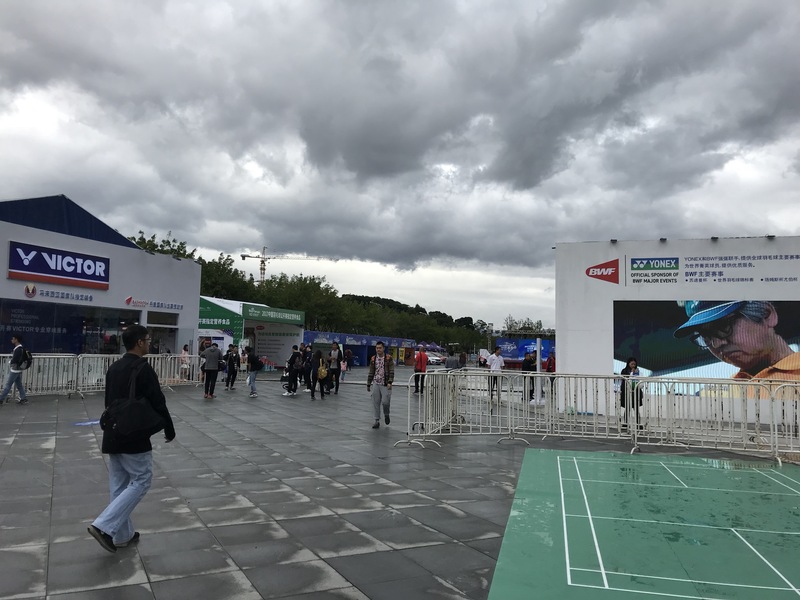 I also saw China vs. China in women’s doubles (spoiler alert…China won) and I saw Marin lose her women’s singles. Viktor Axelson, in white, was just a giant out there on the court. I was far away and still surprised by his height. But the stadium was dark, and cool. They turn off all the lights (and even light proof all the doors) so only the courts and the players are illuminated. It wasn’t pitch black, there were several screen in the middle and sides spreading light throughout the place, but it was a comforting dark, like a ultrasound room, and the people were making a soothing cheer at regular intervals and as the hours went by, and me running on a few hours sleep, a chicken leg and 5 waffle fries I began getting sleepier and sleepier. Over Big Macs at the train station McDonalds (yep, that was dinner. Worst day of food ever) Azhi and I were talking about the whole things. I was saying I was surprised that so few people were allowed to meet with Lee Chong Wei. It seemed like other people didn’t even try to get in line before they closed it. Then Azhi told me what was actually going on. 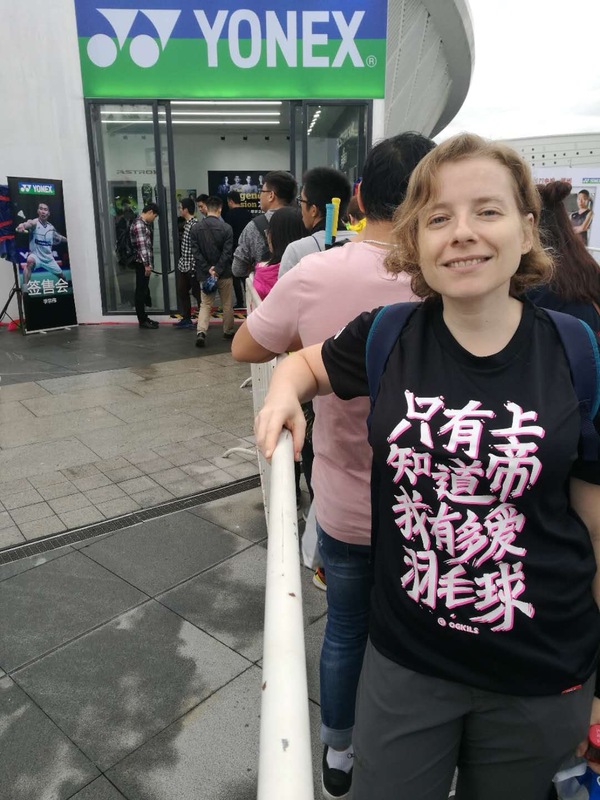 It wasn’t a 150 rmb ($25) spending limit to get in the line, but more along the lines of 1500 ($250). 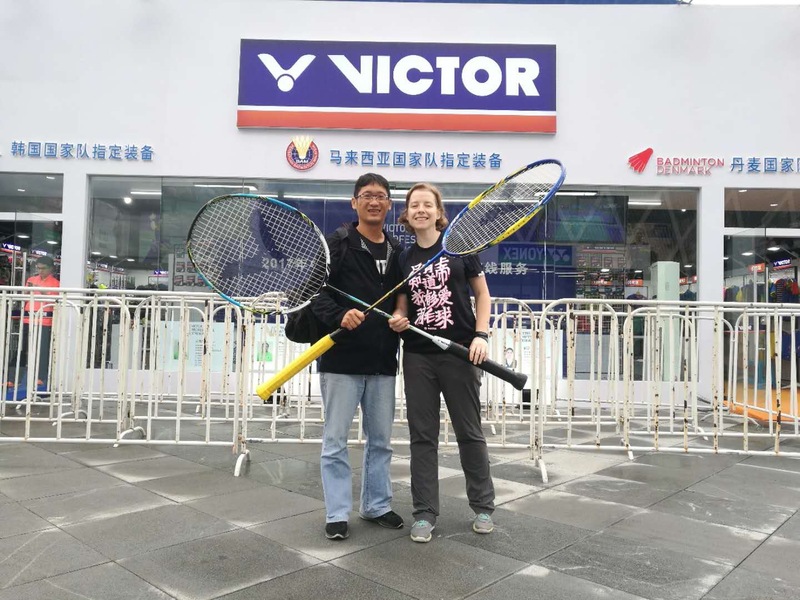 To meet a badminton legend Yonex wanted you to drop some cash. Either because the guard assumed foreigners are rich and I spent a lot of money, or because he assumed I couldn’t speak Chinese and didn’t want to bother, he let me in without checking my receipt or even talking to me. So I really lucked out. Yay for naivety and selective understanding of Chinese! So while the actual games themselves might not have been worth the $100 ticket, the events and the spectacles outside was worth it. 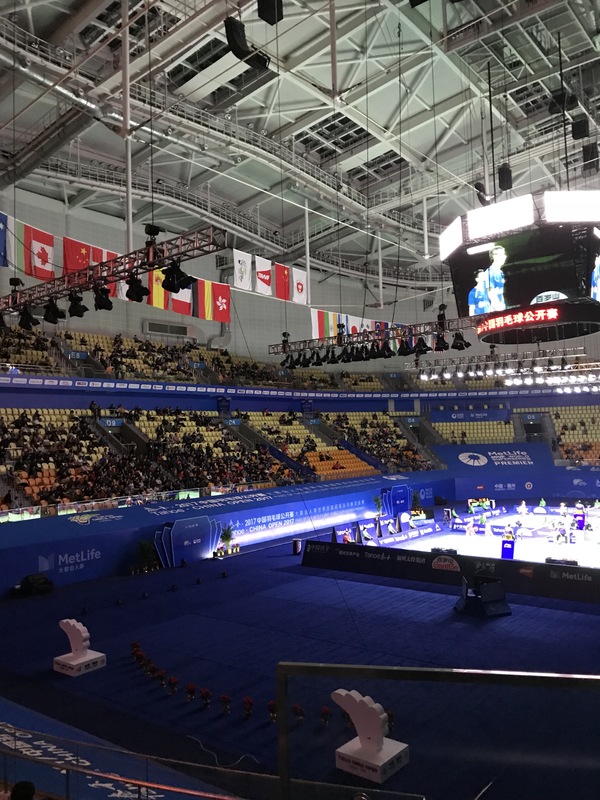 After all, the people going to this game are all pretty avid badminton fans and it is cool being around people who are so excited for the thing that makes me excited. And the shops were fun and there were lots of things to take pics with and I just liked the festive vibe of it all. I wish I had been able to meet more players, but it was fun and worth it. 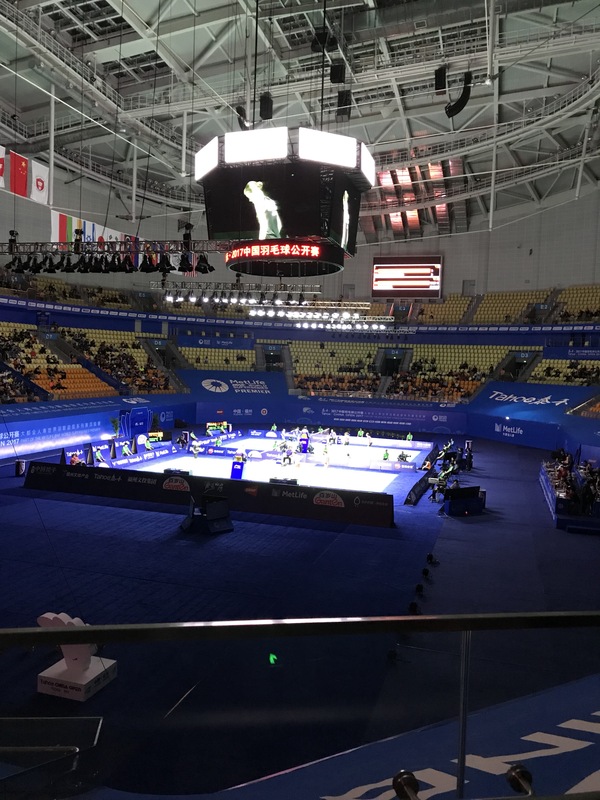 I hope that I can go to more BWF superseries and I wonder if they need volunteers…..
Now it’s back to my training and playing. I might never get to play at their level, but I got my own mountains to climb and competitions to play. On the train ride back I was so tired I didn’t even have it in me for one last selfie. I couldn’t stop yawning. Jealous!!! I’m gonna have to try to get to some more big badminton tournaments in Japan. If Lin Dan is coming, I’m there, haha. Wow, you looked more beautiful than Lee Chongwei. Btw, Lin dan cant speak english. Might be a little, worse than me for sure. You have to teach him before you ask for a photograph with him. Enheng? how good is ur Chinese ? Nihao,xiexie ,woaini ,niaiwo ? Wow ! Amazing! Very good! Didnt realize you can write it that good . I think Lin dan would do what lee chong wei did …. LOVE YOUR SITE!!! Just curious if the Lee Chong Wei movie has been released there yet. Did you see it? Will you do a review of it? Keep up the great writing and training! No! It’s not here yet but we are all waiting excitedly for it to come. Have you seen it? I haven’t heard any reviews yet.